Some people think I look cheap. Her lawyer, Henry Selden, responded, “The defense wishes to concede that Miss Susan B. Anthony is indeed a woman.” That didn’t come as a surprise to anyone in the courtroom. Over many years she had been working to promote women’s rights; she had traveled the country making speeches and writing articles. Along with Elizabeth Cady Stanton, she was the best-known of the women who were involved in the struggle for equal treatment under the law. Prior to the election of 1872, she had consulted Selden, who had been a judge and New York state official. He agreed that her reading of the 14th Amendment was correct; that under its provisions, women were entitled to vote. Following the election, Susan B. Anthony was charged with Unlawful Voting. The trial began in June, 1873; the presiding judge was a guy named Ward Hunt. He was an Associate Justice of the U.S. Supreme Court, and a shockingly bad judge. Among other things, Hunt did not permit the defendant to testify in her own behalf. She was not deemed competent — after all, she was a woman. She didn’t, either, but Judge Hunt didn’t pursue the matter. He undoubtedly knew that if he pushed it, Susan B. Anthony would appeal, and he’d wind up looking — well, like the jerk he was. The case was important because it increased attention on the issue of equal rights, but it wasn’t until 1920, with the passage of the 19th Amendment, that women finally gained the legal right to vote. Susan B. Anthony didn’t live to see that day; she died in 1906. Her vow to never pay a dollar is a little ironic, since her likeness was put on a U.S. dollar in 1979. It was the first portrait of an actual woman (not an allegorical character) to appear on U.S. currency. 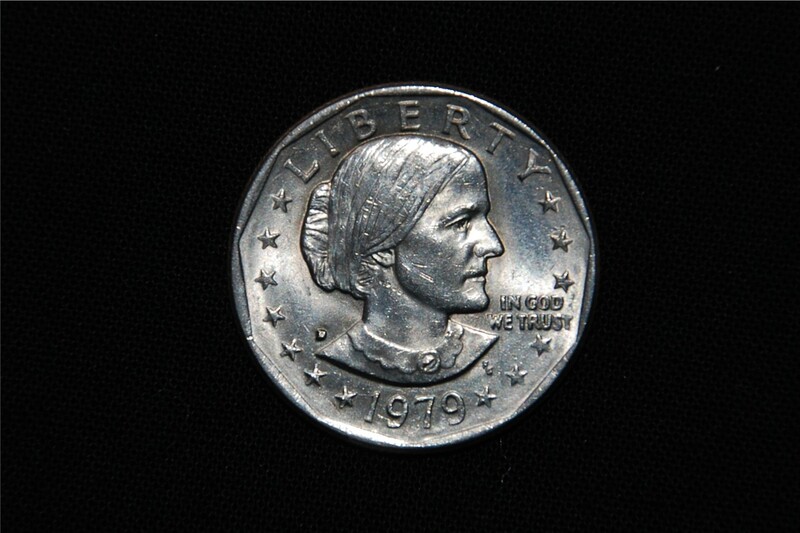 The Susan B. Anthony dollar was not a popular coin because it was too similar in size and shape to a quarter (see photo), so people frequently overpaid with it in vending machines and such. This entry was posted in History and tagged Susan B. Anthony. Bookmark the permalink. Great post about a great leader. I’m proud that she and Frederick Douglass were good friends who generated support for each other’s quests for gender and race equality.